Friedman Fine Art is pleased to present the DePaul Welcome Center graphics. 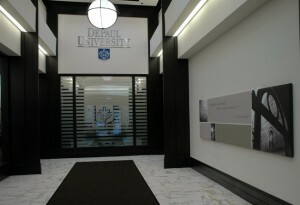 Located in their Lincoln Park Campus, the DePaul Welcome Center houses several of the University’s offices including Undergraduate and Graduate Admission as well as the Alumni Relations office. The graphics for the center were designed to allign with the building’s functionality, specifically as a representative of the student body and the University’s atmosphere. The entire program was fabricated and installed using the finest materials available keeping in mind sustainability throughout the process. The project consists of the following components: Branded wall coverings with dimensional elements, strategically placed video monitors, dusted crystal vinyl applications on glass, vinyl banners, extra large stretch frames and a “Wow Wall” illustrating the school’s logo. To see more images of the DePaul Welcome Center, please follow the link to our slideshow entitled, DePaul University Graphics Program. Friedman Fine Art has been developing corporate and institutional art and graphic programs for the past 38 years. Our firm specializes in designing and fabricating donor recognition walls, history timeline walls, company product walls and corporate graphic walls and installations.